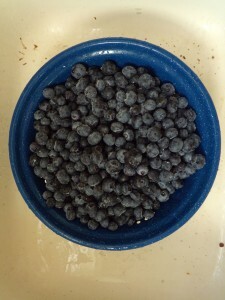 Oodles of blueberries. What a delightful predicament! Let me admit before we go further: I have a penchant for folk music. I also love to can, or at least, I love the results of canning and willfully forget how miserable the actual process often makes me. But good music, frequent taste tests, and the prospect of hoarding jam help ameliorate my suffering. 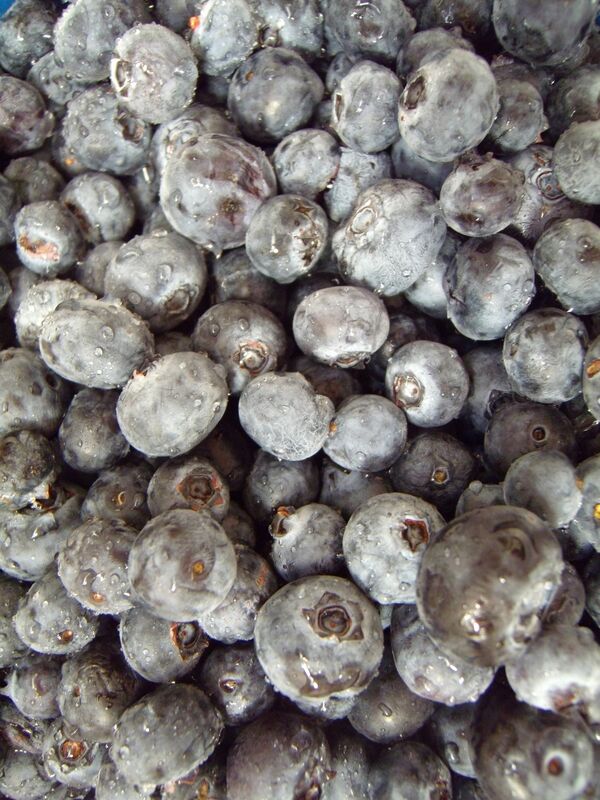 And so it was that I found myself in the kitchen a week ago with 36 dry pints of organic blueberries and a new Doc Watson CD blaring from my crotchety old stereo. The occasion? 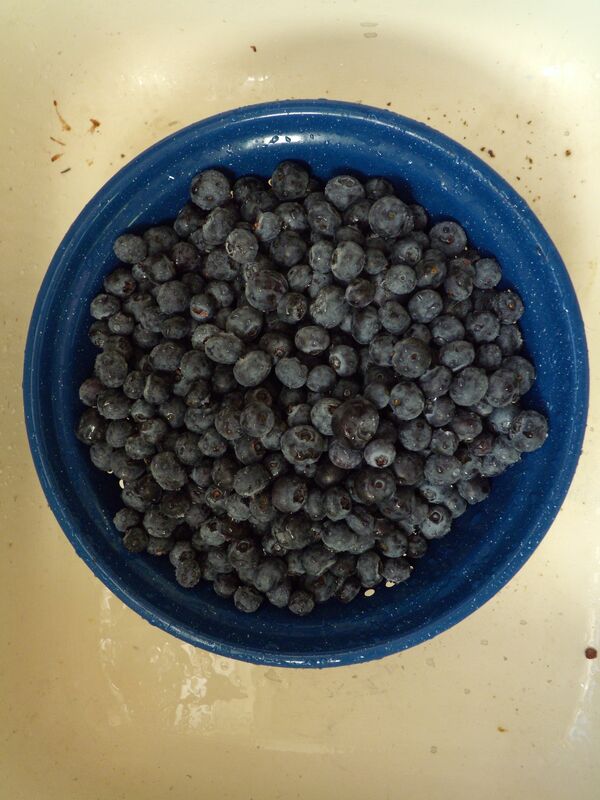 I found the blueberries on sale for a ridiculously good price, and Doc Watson died at the age of 89 in late May, prompting me to finally explore his music and adding to my general sense that the good, true things in the world are being rapidly lost. Suffice to say, it’s now a week later, and I am finally wrapping up production and have listened to Doc’s masterful rendition of “Tennessee Stud” upwards of 30 times, subjecting Kelly and the immediate neighborhood to my own keening accompaniment. There’s nothing quite like counting up your jars when the canning’s done. I am pleased to report that, with Doc’s help, I’ve canned a total of 22 half pint jars and 17 pint jars of the following jams: blueberry jam sweetened with our very own “heartbreak honey”, blueberry jam sweetened with sugar, blueberry/cherry jam, and blueberry/raspberry jam. In case anyone cares, this count doesn’t include the handful of jars that didn’t seal, and which I consumed by the spoonful, nor does it figure the few jars already gifted to friends and family. I feel rich. 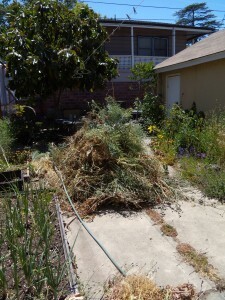 You call that five foot tall pile of newly pulled weeds low maintenance??? We are done. We’re done with backbreaking labor and DIY projects that drag on for months (I won’t name names here, but it knows I’m talking about it). We’re done with spider mites in the greenhouse, and rats in the garage, and half blind city-squirrels that take a few bites out of each persimmon, apple, loquat, and fig. 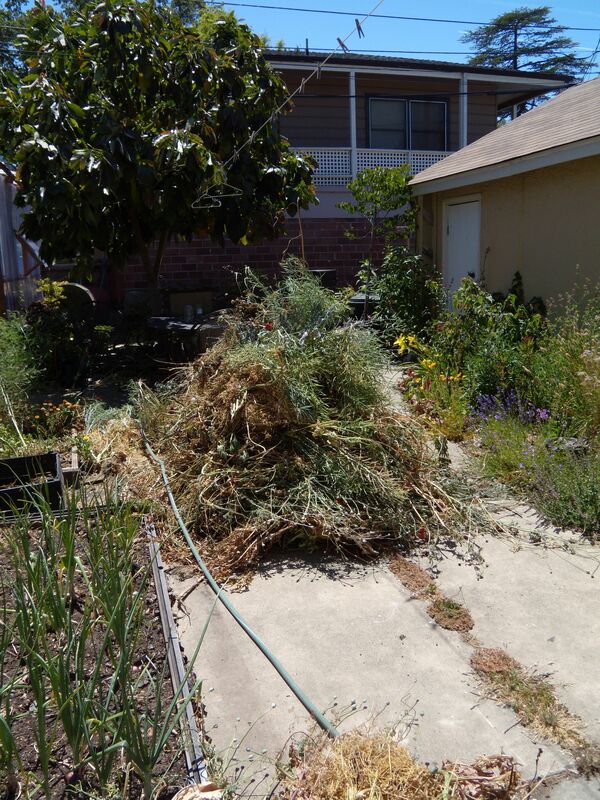 We’re done pulling Bermuda grass and digging ivy. And we’re done having piles of bee equipment in the kitchen and mountains of cardboard stockpiled against the back of the house. Most of all, we’re done with our own minds and our tendencies toward stress and anxiety. We’ve decided we need a garden slave (or at least a housemate who pays their rent in gardening services). The only sticking point is that Kelly is unwilling to live with them. As a compromise, we will endeavor to practice low maintenance gardening, something we have always strived toward, but virtually never achieved. 1. We will spend our gardening energy this summer tidying and catching up, rather than rooting around for more hair-brained projects to embark on. 2. We will plant out only the starts we have in the greenhouse and will leave several beds mulched and fallow. 3. 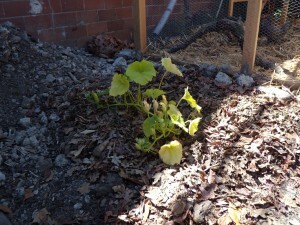 We will thoroughly mulch the summer garden with leaves to cut down on watering. 4. We will finish installing drip irrigation to further cut down on water use and time spent watering. Gardening has become a bit of a chore and a stressor. While I can’t imagine postponing time in the garden for when I am 70 or 80 and finally get to retire, something has to give. There are baby cucumbers languishing in the greenhouse. There are beehives bursting at the joints, in need of honey supers and frames, and there is Kelly and me, utterly exhausted and miserable. Low maintenance gardening, here we come. I killed the mealworms. For months, I heard their rustlings as they navigated through layers of laying mash and newspaper. I dutifully gave them halved potatoes and cabbage leaves to keep the proper level of moisture. 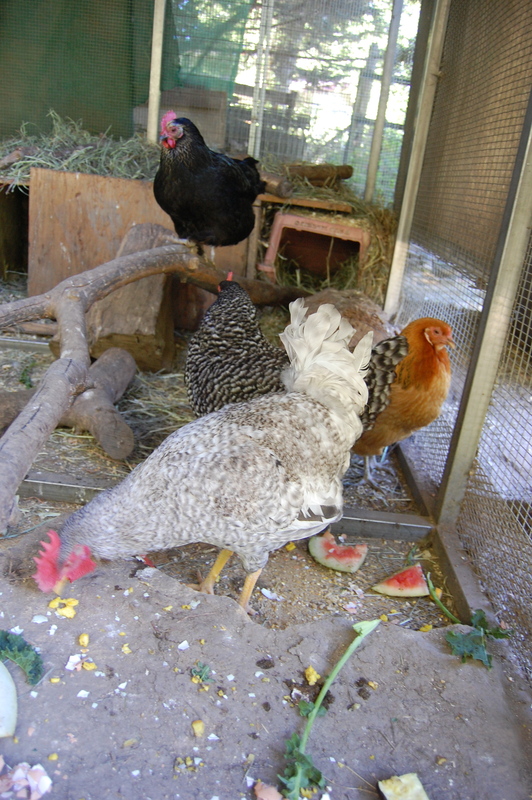 When the roosters moved away and the hens took up residence in their outdoor coop, I slipped. There’s no good excuse. I just wasn’t passing through the former chicken room as often, and the poor mealworms weren’t on my mind. Then Kelly informed me that the rustlings had ceased. I went to take a look and found a crowd of dead beetles lying atop the mash. This is what I get for being too busy and too careless to notice. Rest in peace, mealworms. Petunia is happiest when she’s off the ground, and shoulders are a top perching choice for her. 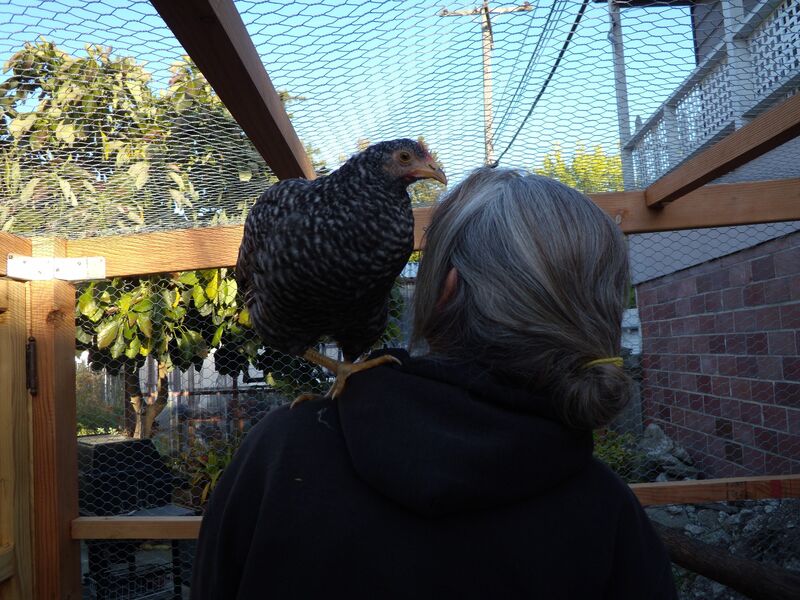 I never thought I’d tire of having our little Barred Leghorn flap up to perch on my shoulder. Petunia’s all feathers, really—a lean, spry little thing, no heavier than a loaf of bread. She has toenails, though—sharp ones! And she has a powerful little beak and a bad habit of pecking the backs of our heads and shoulders in search of edible morsels. At first, she only flapped up occasionally, tilting her head from side to side to gauge the distance and strategize a flight path. These days she’s more confident, arriving suddenly on our shoulders amidst a cloud of feathers and dust. This morning, Kelly wiped down scratches on my back with hydrogen peroxide after I took an ill-advised trip to open the coop wrapped only in a towel following my morning shower. I’ve decided that Petunia takes us for granted, that she has come to see us as purveyors of treats and handy vantage points from which to catch a better glimpse of her surroundings. Kelly gives her the benefit of the doubt and remains convinced that Petunia is just highly social and enjoys our companionship. This may also be true. I have to wonder, though, what her crash landings on our heads and shoulders will feel like when she is full grown and whether there is some way to train chickens in the etiquette of personal boundaries. I’ve begun reading Storey’s Guide to Raising Chickens, by Gail Damerow, and take comfort in the knowledge that the book does contain a section on chicken training. I’ll keep you posted. What Ever Happened to the Boys? When they left home in a cat carrier a few weeks ago, our young roosters went to stay with friends who live in the country about an hour away. The idea was that our friends would adopt one rooster and that we would continue looking for a home for the second one. But things are never that simple around here. A week later, we got a phone call. Our friends had spent the afternoon introducing the roosters to the rest of the flock, and things had not gone as smoothly as anticipated. Instead of getting bossed around by the full-grown hens, our little roosters had terrorized them, chasing them down with adolescent bravado. More surprisingly, they had terrorized the ducks. After taking just moments to identify the male duck in the group, Oliver and Finn had chased him relentlessly. The duck, a non-confrontational fellow about three times their size, eventually took them each by the neck feathers and pinned them gently but firmly to show them who was boss. But with foolhardy machismo, our trouble-makers returned to their duck-chasing ways less than five minutes later. At this point, the duck became intimidated and started running from them too. Our search was on; we had to look for two homes instead of one. Anybody in the know will tell you that finding homes for roosters isn’t easy. And we’re a bit choosy, wanting to make sure our babies get to enjoy full rooster lives. My tardy blog post spares you the stress and uncertainty of the past few weeks. Suffice it to say we have located two potential homes in our local area. But there’s also been an unexpected turn of events in the flock. Sweety, an 11-year-old hen of uncanny rat killing expertise, has taken a liking to Finn. After the first botched introduction, the roosters have been living in a portable chicken tractor where they can socialize with our friends’ flock without having physical access to it. Apparently, over the past several days Sweety and Finn began eyeing each other through the avian wire, spending time beak to beak and communicating in mysterious chicken ways. Kelly and I went up for a visit yesterday afternoon and found Finn in with the girls. For the most part, he minded his own business, scratching for food while Sweety kept a watchful eye on him. It remains to be seen whether his good behavior will earn him a reprieve, but reliable sources tell me Sweety is known as an excellent judge of character. She’s spent most of her life as top chicken, presiding over the flock with a firm but fair approach to keeping both the pecking order and peace intact. It’s been theorized that she may be grooming Finn as her successor (though as his mother, I wonder if he’s a bit on the ditzy side to follow in her footsteps). As mentioned previously, Sweety is also known for deftly killing any rat who dares to enter the coop, cornering the animal and administering several stunning pecks to the head before using her beak to grab the creature by its nose and shake it violently until its neck breaks. I’m impressed. Finn has a lot to learn, and I hope he makes the cut. Kelly is everyone’s favorite around here. 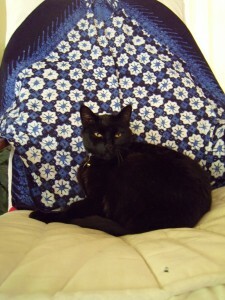 She is Pudy’s soul mate snuggler, and superstar provider of scrumptious treats to the chickens. Unfortunately for all of us, she is on vacation, basking on the sunny banks of the Sacramento River and enjoying the company of dear friends. We in the garden are happy for her, and we’re getting by for the most part. Pudy is under house arrest after successfully hunting a baby Bewick’s Wren this afternoon and dropping it dead at my feet. I suspect she also killed its sibling yesterday, and I’m unsure whether the poor parents have any children left in the nest. Bird killer turned napper, Pudy is a good sport about her temporary confinement. 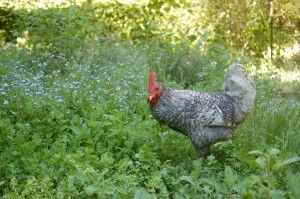 The chickens are growing like weeds now that they have sunlight and room to run around. They come up hopefully each time I pass by, and I finally rewarded them this afternoon with a handful of the special treat mix Kelly made. It’s a blend of corn, flax, nutritional yeast (is that even good for chickens?! ), and I don’t know what else. The girls go crazy for it. 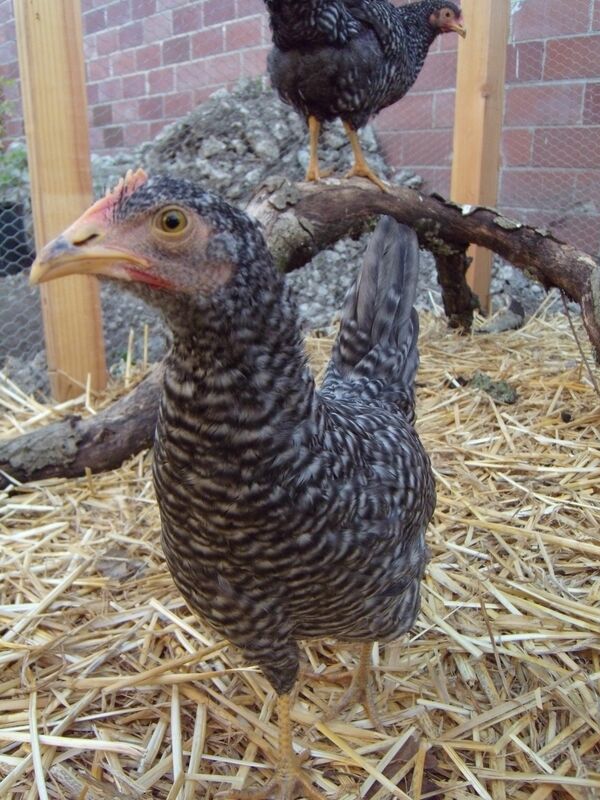 Petunia is the braver and more curious of the two hens. For the past three nights, the hens have been putting themselves to bed. As afternoon wears on, they watch for me from the corner of the run. If I come in to visit, Petunia flies up to my shoulders to hang out, while Lu paces around, tortured by indecision. 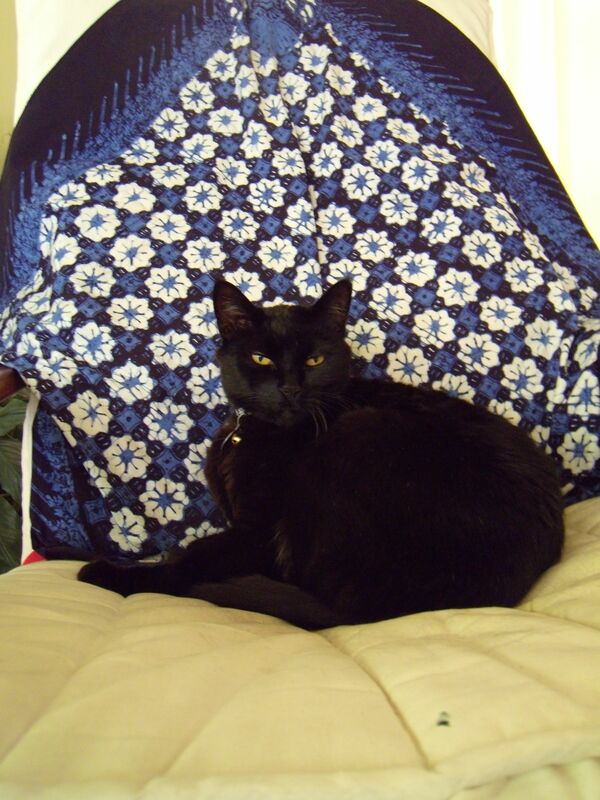 She finds direct human contact distasteful and threatening, but she hates being left out. Just before dusk, the girls dutifully head up the ramp into the coop and find spots to sleep on the roost. They are almost too adorable for me to bear, and I am so impressed by their grownup ways. Like the chickens, the weeds are also growing like weeds. I spent time this evening pulling them, along with overgrown beets, and shriveled carrots. I managed to get the ‘Sweet Meat’ squash planted, as well as my precious ‘Bushy Pickling’ cucumbers. Then I ambled around to the front yard to see what trouble I could stir up. 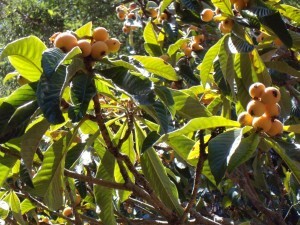 The loquat tree, which served as a great winter bee food source from December through February, is full of fruit. For the past week, I have watched a band of squirrels devouring the fuzzy yellow globes. The night was young. I set up a ladder and climbed into the tree’s branches, a grocery bag tucked under my arm. I managed to harvest just over four lbs. of loquats. Turns out, this equals a little over two lbs. of edible fruit (thank you, fabulous hanging produce scale!). What does anyone do with loquats besides eat them off the tree? 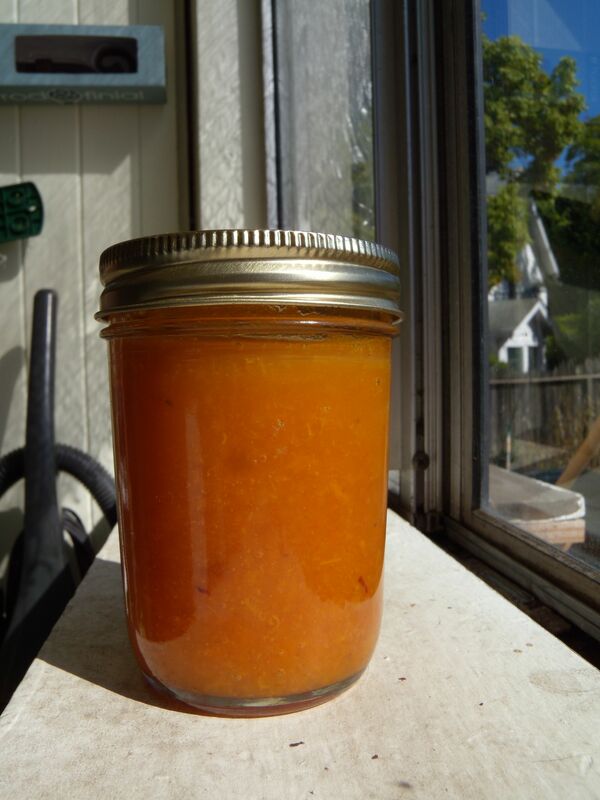 I turned to my trusty laptop and found that some folks do indeed make loquat jam. I combined two recipes I found online. All told, it took me three hours to produce five little half pint jars of jam (it may end up more like a thick sauce). I was particularly happy that every last jar sealed with a satisfying pop. One of the five limited edition jars of loquat jam. I’m exhausted, but undeniably pleased. I’ve always enjoyed the flavor of loquats, and from tonight’s spoon-lickings, I think the jam will be delicious. If Kelly’s lucky, I might even share some with her when she gets home. For more loquat ideas and a detailed recipe check out our post, How to Make Loquat Liqueur.